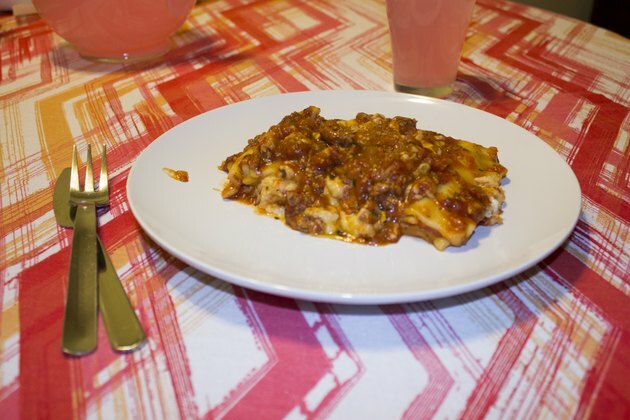 Costco, the members-only wholesale club, sells two types of frozen lasagna under their store brand, Kirkland's Signature, and occasionally offers a fresh version in the deli. These preassembled dinners save time spent precooking the filling and assembling a lasagna from scratch. Just like homemade, they are layered with noodles, meat sauce and cheese. Look for these lasagnas in a three-pound tray or a family-sized six-pound tray. The packaging varies slightly depending on the size, and cooking times also differ. Keep the Costco lasagna frozen until ready to cook. Preheat the oven to 375 degrees Fahrenheit. 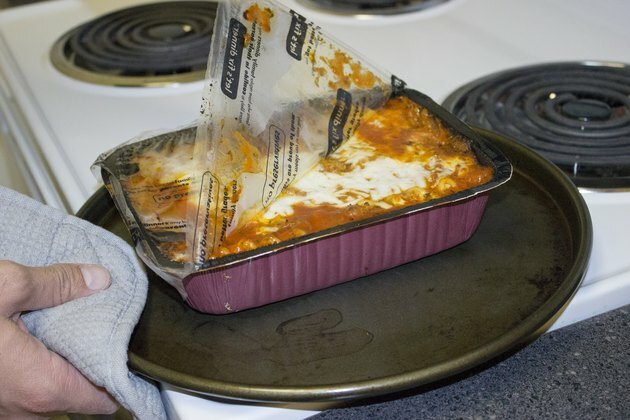 Remove the lasagna tray from its packaging and lift the corner of the film to vent. The frozen three-pound lasagna comes in a foil-lined paper tray with a plastic film. 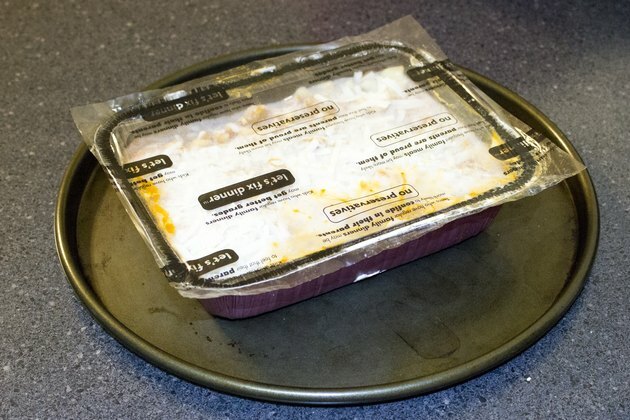 Fresh lasagnas come in a foil tray with a clear plastic lid that must be removed entirely before baking. 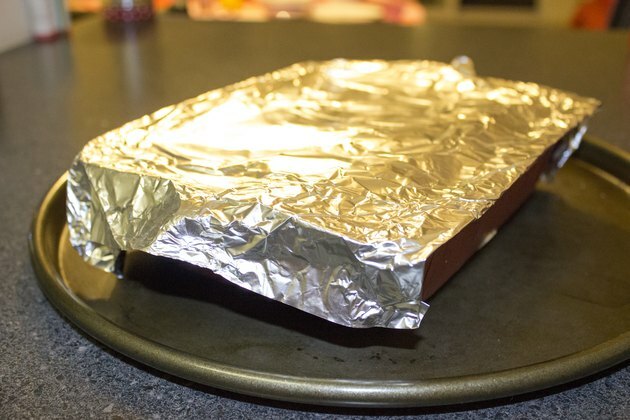 Cover the foil tray with a piece of aluminum foil that is tented slightly to vent the lasagna. Place the tray on a baking sheet. Bake the lasagna for about 50 minutes. Remove the film cover or tented foil and bake for another 10 minutes to brown the cheese on top. A frozen three-pound lasagna might need up to 70 minutes of total cooking time. Remove the tray from the oven. 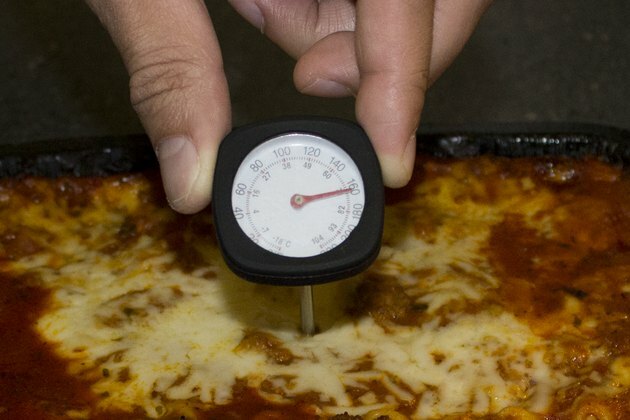 The ground meat inside the lasagna must reach a minimum temperature of 160 F, so insert a meat thermometer in the center of the lasagna and increase the cooking time, if needed, to achieve the proper temperature. Pre-heat the oven to 375 F. Remove the tray from the packaging and tent the aluminum lid over the lasagna. Bend it slightly in the center so steam can vent out the sides. Set the tray on a baking sheet. Bake the lasagna for about one hour and forty minutes. 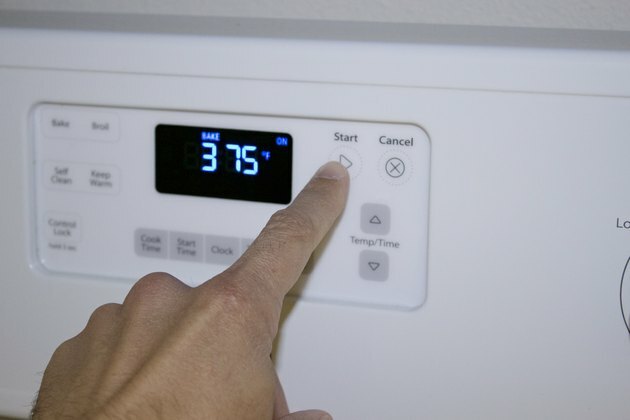 Remove the lid from the lasagna and bake for another 20 minutes for a total of two hours, or until the internal temperature reaches 160 F. Insert a meat thermometer in the center of the lasagna and adjust cooking times as needed to achieve the safe temperature. The lasagna will be bubbling and hot when you remove it from the oven. Allow about 10 minutes of rest time before serving.